Ranking and Reviews of the Best Probiotics Supplements! Unless you’ve been living in a cave, you’ve probably noticed that probiotics are all the rage right now (and have been for some time). Everyone from doctors to celebrities to normal, everyday people now tout their benefits. These little wonders have been credited with relieving traditional “gut” issues like stomach pain, bloating and gas. And far more serious conditions like IBS, Crohn’s, ulcerative colitis and diarrhea. But did you know that newer studies suggest probiotics may also help out with things like weight loss, allergies, blood pressure and acne? Although more research is needed, the general consensus is they seem to be effective in treating and/or preventing a wide-range of illnesses and conditions. So how do you take advantage of all this to improve your health? The world of probiotics can be perplexing and there are literally hundreds of different supplements, all claiming to be the best. They come in the form of capsules, tablets, powders, liquids, gums, shells, beads, and lozenges. They have confusing ingredient names like Bifidobacterium bifidum and their labels have strange phrases like “colony forming units”. Sometimes it feels like you need a PhD just to figure out which supplement to take! Our probiotics experts continually rank, review and test just about every popular probiotic supplement on the market. We’ll tell you which ones we like and which ones we’d avoid. We’ll tell you what’s in them, how much they cost and what conditions they may help with. In a nutshell, we’ll tell you everything you need to know to make an informed decision about probiotics and the supplements that contain them! So keep reading if you want to learn more about them and how they work… or go straight to our list of the best probiotic supplements. What Are Probiotics And Why Is Everyone Taking Them? And the American Gastroenterological Association define them as, “living microscopic organisms, or microorganisms, that scientific research has shown to benefit your health”. Basically, probiotics are the “friendly” or “good” bacteria and yeast that inhabit your digestive tract. Probiotics are found in your body right now, in certain foods and in probiotic supplements. They play a role in a lot of different processes within your body but the main one, in our opinion, is their ability to maintain BALANCE. You see, in addition to friendly bacteria, your body is also host to, and is constantly being invaded by, “bad” bacteria. So probiotics are very important in colonizing your body and keeping these bad bacteria in check. When this balance is maintained, it can have tremendous health benefits for your digestive system and immune system. But when this “balance” gets out of whack, that’s when you start to experience a bunch of different health issues, ranging from the annoying all the way up to the life-threatening. Now you’re probably starting to see why these things are so popular and why so many people use them on a daily basis. Remember– it’s all about balance. Probiotics and Your Health: What Kinds of Illnesses and Conditions Do Probiotics Help With? Ok so now that we all know how great probiotics can be for your health, what kinds of things can they help with? To answer that, what we have to go on are all the studies that have been done over the last few decades. Before we get to the list, keep in mind that the variables are nearly endless when doing these kinds of studies. You have different people trying different strains in different environments using different forms and delivery methods. As such, what may work for one person may or may not work for another. As you can see, they’re thought to help with, prevent or treat an astonishing number of ailments and diseases! Given that 70-80% of your immune system lives in your digestive tract, is it any surprise that probiotics play such an important role in good health? Click here for more information on taking probiotics for stomach pain. Should I Take A Probiotic Supplement or Just Eat Probiotic Foods? Although Probiotics Guide focuses mainly on using supplements to reap the benefits of probiotics, there are a number of foods that also contain probiotics. In fact, as the popularity of probiotics has spread, manufacturers seem to be adding them to every type of food imaginable! Despite all the claims however, many seemingly probiotic foods are not very effective delivery vehicles. Because most food today is overly-pasteurized or otherwise acidified, the probiotic colonies in these foods are often destroyed before they even make it to your digestive system. Truth be told, modern commercial production methods just aren’t probiotic-friendly. And that’s a shame because some foods like yogurt, kefir and raw cheeses can be an excellent source of probiotics… as long as they aren’t overly-pasteurized. Are Probiotics Safe and What Are Their Side Effects? Most experts and medical organizations consider probiotics to be very safe. This is mainly attributed to the fact that probiotics have been around a long time in foods like yogurt– and have been available as supplements for decades. In addition, as probiotic use has become more mainstream over the years, the number of studies have steadily increased. And none of these studies have shown any serious drawbacks to probiotic use in relatively healthy people. Despite their apparent safety, more research is being done to see if probiotics can treat specific diseases. And to see how different strains and probiotic combinations effect different people. And lastly, to study their long term effects. Currently the only reported side effects to probiotics use is gas and bloating, both of which are usually temporary. Given all this, there are still a lot of unanswered questions about whether probiotics should be used by children, the elderly and the very sick. In those cases, it’s best to speak to your doctor to see if probiotics make sense. Click here to read more about probiotics for children. What’s The Best Way To Use Probiotics (how much and for how long)? Most experts agree that here are two different ways to use probiotics to benefit your health. The first is to use a daily probiotic to maintain digestive and immune health. In this case, you’d want to make sure the supplement you’re using contains between 5-10 billion CFUs. CFU stands for “colony forming units” and is the proper way to measure the given amount of probiotics in any supplement or food. Keep in mind that “more” CFUs does not necessarily mean “better”. Taking a supplement with too many CFUs can lead to some undesirable side effects like abdominal pain, bloating and gas! The second way to use a probiotic supplement is to treat a specific illness or condition. In this case a therapeutic dose is usually between 10-40 billion CFUs. Many people use a daily product for maintenance and then either increase their dose or use a different strain(s) when an illness pops up or they’ve just finished a course of antibiotics. To answer the question of how long to use a probiotic supplement, the answer is as long as you want to experience the benefits it provides. In addition, there are many different species and strains of probiotics. Some colonize great in some people but not in others. And realize that more strains in a particular supplement does not necessarily mean it will work better. These strains often compete with each other, and sometimes can cancel each other out. So be leery of any supplement that contains a ton of different probiotic strains! To be completely honest, it usually takes some experimentation to find the probiotic that will work best for you. So What Are The Best Probiotics Supplements For 2019? By now you probably realize probiotics are great for your health! But as you go searching for the perfect probiotic supplement, your head will start to spin once you see the dizzying number of choices. There’s literally hundreds of different brands out there and hundreds of different probiotic strains in hundreds of different combinations. Add to that the fact that probiotics aren’t regulated by the FDA and you can see how difficult it can be to choose the right supplement. But fear not… that’s where we come in! Each year we put together a detailed ranking and review of what we think are the best probiotics supplements currently available. 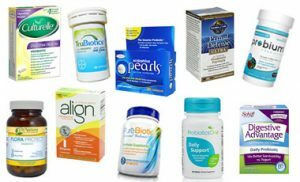 To find the best products, we actually go out and buy all the probiotics supplements we can find– pills, capsules, tablets, powders, shells, pearls, and more. We buy them on the internet, in grocery stores, in health food stores– you name it, we buy it! We examine the ingredients, the bacteria count and the overall profile of probiotic strains used. We look at the delivery method to see if it’ll survive passage through the stomach. We’ll see if it contains any milk, wheat, gluten, yeast or GMOs. We’ll also examine the price of the supplement and how much it costs per day. After we’ve done our initial review, then we’ll actually try the product on ourselves. That’s right, we take each supplement and report the results of how we feel right here! Then, based on all this we’ll assign a rating to each supplement. It’s this overall rating that determines our list of the best supplements available today! So click here to see our current list of the 10 best probiotic supplements. Probiotics are a very exciting and very promising field of science right now. As more studies are completed, we’re starting to see that they are useful in treating a wide range of conditions. As these studies teach us more and more about these microorganisms, it’s important to stay on top of the research in order to best use probiotics to improve your health. And that’s exactly what we’re going to do for you here. In addition to continually reviewing all the latest supplements, we’re also going to let you know when something meaningful happens in the probiotic field. Simply follow us on Facebook, Twitter, YouTube, and Google+. Remember, all of these things are 100% free! By keeping in touch, we’ll let you know every time we review a new supplement or update our rankings.